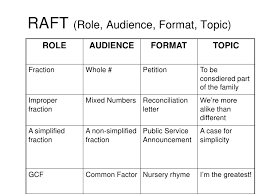 Vandevanter in Houston (2010:10) defines RAFT is a writing-to-learn strategy that allows students to process information by writing about it in a non-traditional format.where ROLE of the writer: Who are you?, AUDIENCE: To whom is this written?,FORMAT: What form will it take? and TOPIC: What is the subject of this writing? The RAFT strategy provides an easy, meaningful way to incorporate literacy skill into classroom. RAFT is an effective way to differentiate instruction by providing tiered activities, projects on the same text or topic can be adjusted according to students’ achievement levels, English proficiency, and interest. Herczog and Porter (2010: 48) To use this strategy students choose an appropriate topic, such as one from the earlier Evaluate, Take, and Defend a Position strategy or one from the activities listed after each lesson in the We the People text. Students examine the topic (the T in the acronym) by considering each part of RAFT before they write about or otherwise develop the topic. Who are you as the writer? Are you Abraham Lincoln? A warrior? A homeless person? An auto mechanic? The endangered snail darter? To whom are you writing? Is your audience the American people? A friend? Your teacher? Readers of a newspaper? A local bank? What form will the writing take? Is it a letter? A classified ad? A speech? A poem? What's the subject or the point of this piece? Is it to persuade a goddess to spare your life? To plead for a re-test? To call for stricter regulations on logging? b) Analyze the important ideas or information that students need to learn. c) Brainstorm possible roles, format and audiences. d) Use a strong verb in assigning the topic (e.g. persuade, plead, demand). e) Ask students to write their paper using the Role, etc. a) Using your essential questions, analyze the important ideas or information you want students to learn. Consider how writing might enhance student’ understanding of a topic. The topic can be a creative title or stated in general terms, as long as it is clear to the student the goal of the assignment. b) Brainstorm possible roles students could assume in their writing. For example, a student in auto class could imagine he was a spark plug and describe what occurs when an engine starts. c) Next, decide the audience for this communication. Using that audience, determine the writing format. For example, the spark plug could be writing in the format of a diary to be read by new spark plugs just placed in cars. d) Explain RAFT to the students and list the role, audience, format, and topic for writing. You may want to choose different roles from which they can choose based on the same knowledge, reading, or concept. Belum ada tanggapan untuk "ROLE, AUDIENCE, FORMAT AND TOPIC (RAFT) STRATEGY IN READING COMPREHENSION"